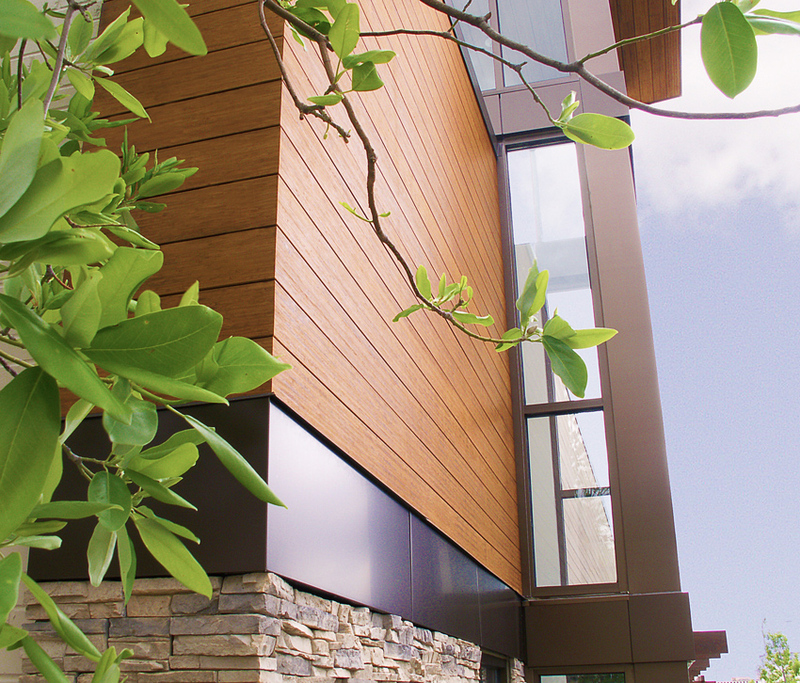 For cladding uses, exterior grades of engineered bamboo include SBPs and LVB, which are available in several color and grain options. Solid LVB can be used as single-skin panels and related cladding components for various types of envelope construction, including rainscreens, soffit panels, siding, fascia, and hybrid systems with other materials. Typically, the products must be specified to meet reference standards, including ASTM E84: Test Method for Surface Burning Characteristics of Building Materials; the European National Standards’ EN 438-2: Decorative Panels/Engineered Panels; or the corresponding DIN standard by the German Standards Institute. To design exterior systems with solid LVB, architects can select from a variety of standard components from 8 feet to 16 feet in length. Standard products include 4-foot by 8-foot panels in thicknesses of 1/2 inch, 3/4 inch, and 1 inch. The SBP and LVB products are then complemented with attachment hardware. This hardware can be based on a variety of steel and aluminum clipping systems. The SBP and/or LVB can also be applied directly to the exterior or interior substrate of the building with stainless steel fasteners. For rainscreens, systems available from fabricators include standard dimensional lumber size slats with pre-engineered corner details and window trim. Detailed similar to other rainscreen systems, the LVB panels are hung with clips on predrilled furring strips leaving an air space between the panels and the sheathing behind, which is usually faced with an air/moisture barrier. Other clipping systems can be used that do not use furring strips as well. For rainscreens, systems available from fabricators include standard dimensional lumber size slats with pre-engineered corner details and window trim. The LVB panels are hung with clips on predrilled furring strips, with an air space and air/moisture barriers. Mechanical properties for the LVB rainscreen panels are similar to those for engineered bamboo products used for structural and glazing systems. They exhibit high tensile strength parallel to grain and higher dimensional stability than wood-based counterparts. The fire rating for typical LVB panels are rated Class B per ASTM E84. Manufacturers are continuing the research for topical and premixed stain applications, which will help LVB achieve a Class A fire rating. In terms of rainscreen design options, LVB panels are finished in standard colors created by various kinds of thermal treatment. The coloration visible from the exterior carries throughout the entire material. A variety of stains are also available, should a project require a specific tone. A variety of stain and finish systems are currently available on the market that can be used to coat LVB products. It has been found through testing that most water-based systems do not work well with LVB products. With the new stain and finishing advancements in nano-technology and water-borne systems, sustainable coating options are becoming available to complement the sustainable nature of LVB products. 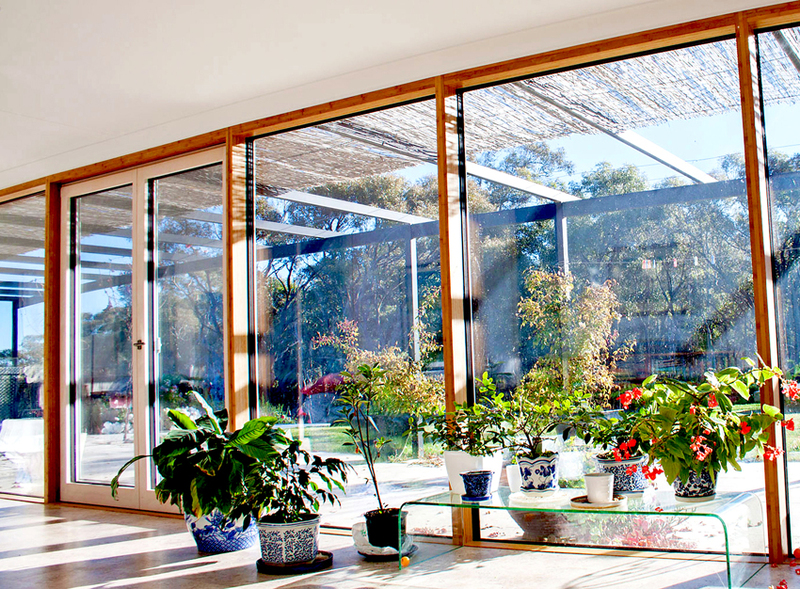 Any visible structural bamboo can be similarly treated to match the rainscreens. This includes beams, columns, and trusses, as well as prefabricated layups and curtain wall systems. With these products, virtually all of the structural needs for a given building projects can be addressed using LVB and SBP components. Virtually all of the structural needs for a given building projects can be addressed using modular, pre-engineered LVB and SBP components. 1. Material integrity. Specify materials manufactured to meet or exceed basic performance criteria, including water absorption of less than 1.0 percent based on EN 438-2 (7). Make sure that the material is nonporous, especially on all exposed surfaces and edges. For color stability, the ISO standard 105 A02-87 (a 3,000-hour xenon lamp test) should yield a 4 to 5 grey scale. 2. Healthy materials. Engineered bamboo provides a valuable specification for architects and their clients who desire materials that do not support microorganic growth. This can be specified under “microbial characteristics” for both structural and exterior grade products. In terms of cleanliness, properly finished engineered bamboo can be easily cleaned with typical cleaning solutions used on other typical wood or natural based products.